These double disc vinyl wallets are ideal if you need to pack two discs within a single compact packaging option, whether it is two different CDs or a CD and DVD, this 4 page double CD wallet will definitely grab attention and make a great impression. The card wallets are a four page design, so you open them up and then see the artwork of the top disc through the central cut-out hole in the inner right panel. The two discs are packed in layered card pockets with the openings facing the inner spine (see further down this page for a close-up detail picture) to avoid scratching each other and to allow independent removal of the discs. The 12cm vinyl-effect CDs are very popular for both singles and full albums. 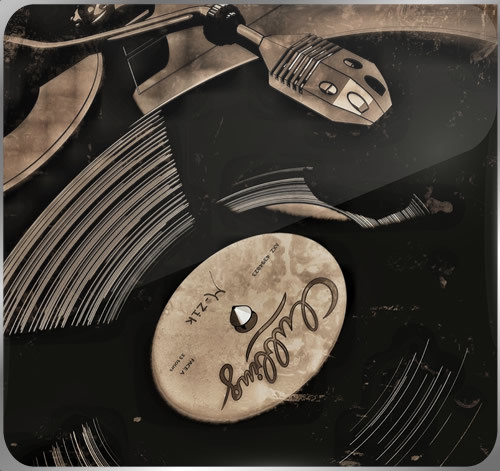 The CDs have a solid black, gold, silver, white, red, orange or green ridged spiral running around the outside of the disc on the printed side, looking exactly like grooves in a record. The data sides of the discs then match the top colour of the discs for the black, silver, red, orange and green discs (it is just the gold and white discs that can’t have matching colour data sides and they are a standard silver underneath). The vinyl DVD options are available with either black or gold vinyl grooves on top and then purple data sides. 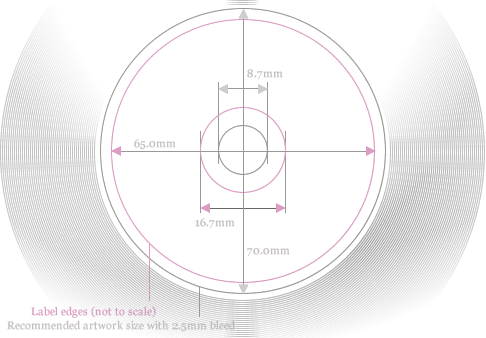 These 12cm circular vinyl CDs have a capacity of 700MB and a 65mm full colour printed area in the centre of the disc within the vinyl effect. The vinyl DVDs have a standard capacity of 4.7GB. Our new UV LED printer allows us to print full colour artwork under the vinyl-effect ridges and grooves, which means that we can now print almost any colour top surface to the discs, or even print marble and tie dye effects over the full area of the disc. 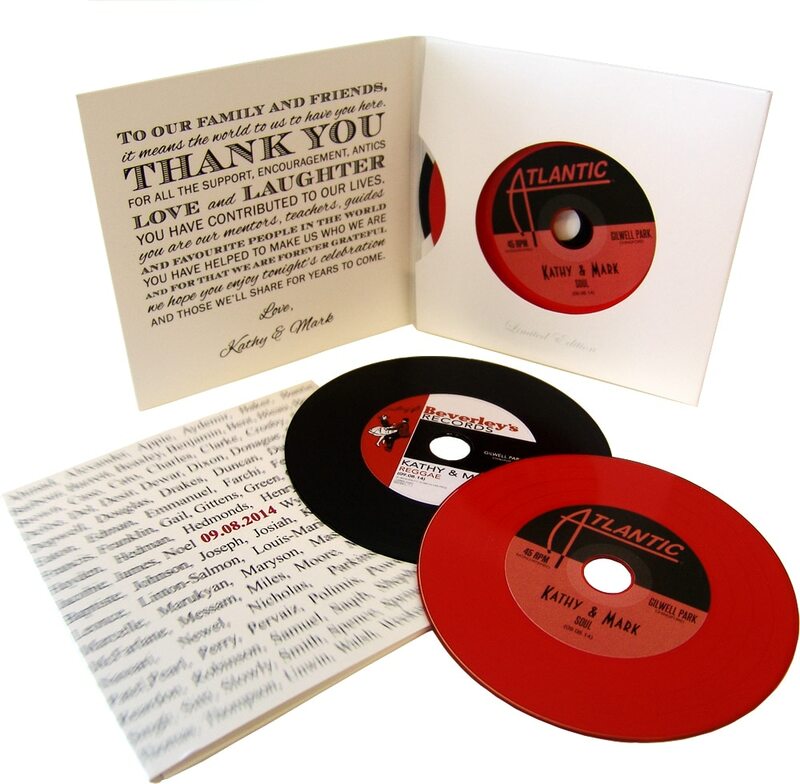 Your own artwork or text can also be added and printed directly onto the discs rather than via a sticker label click here to find out more about our full coverage vinyl print CDs. 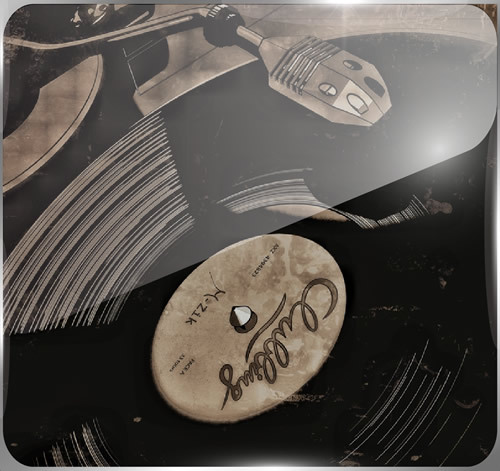 We can now offer full surface on-body printing of your artwork with the vinyl ridges and grooves laid on top, for some stunning effects on the discs. The standard central printed labels are replaced with a very durable and extremely high resolution on-body print that is still available with coloured bases (CD data sides of either silver, black, orange, green, a light turquoise blue or purple). 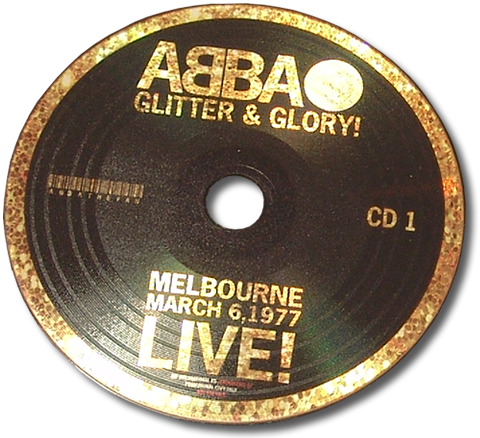 We can either print onto a white base layer for accurate colour reproduction or for a reflective metallic effect (highly recommended) we can print directly on the silver reflective disc surface as shown in the Abba disc. 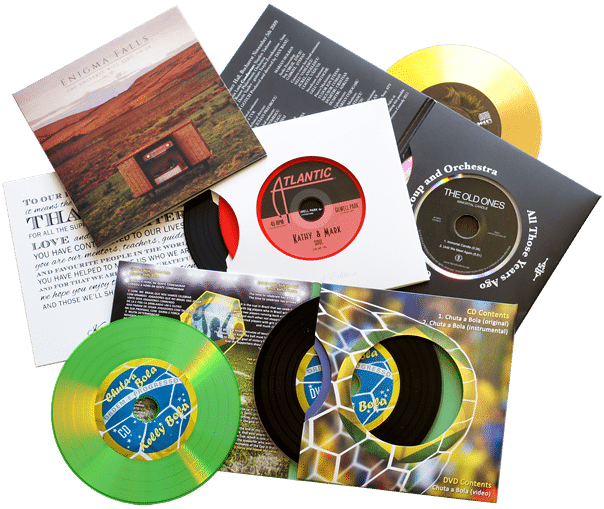 If you wish to go for full coverage vinyl CD printing then please add £0.35+VAT per disc if ordering fewer than 100 copies to the costs in the pricing tables above, or for quantities of 100 or more, it is just £0.25+VAT per disc. As standard the gatefold wallets are supplied with no laminate coating applied, however for just £0.49+VAT per wallet for quantities up to 499 copies or £0.29+VAT per wallet for quantities over 500 copies, we can coat them in either a gloss or matt plastic laminate. The lamination makes the wallets far more durable, stronger, more resistant to liquids and a little more rigid. In the case of the gloss laminates the colours are enhanced with blacks looking deeper and colours richer overall. With matt lamination, finger prints do not show up at all, but colours are not quite as deep and appear a little lighter than either the uncoated or gloss options. If you wish to get your vinyl CD gatefold wallets laminated then please mention it to us when placing the order and let us know whether you would prefer matt or gloss. If you would like your CDs in a clear wrap for a glossy protective finish that is ideal for retail environments or presentation purposes then please add £0.08+VAT per disc for either a shrink wrap or a cellophane resealable wrap. 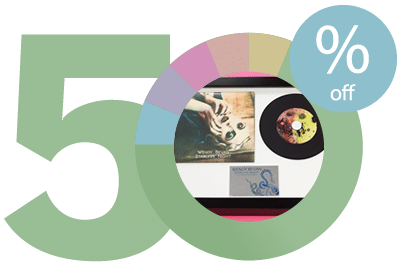 When placing a CD order with us, you can get 50% off our CD presentation frames when using the discs from your order and being ordered and delivered at the same time as your CDs. The frames are fully finished, ready to hang and include additional copies of your release and can even be provided with a full colour printed metal plaque with your artwork on to celebrate the CD release or as a memento for the band members. 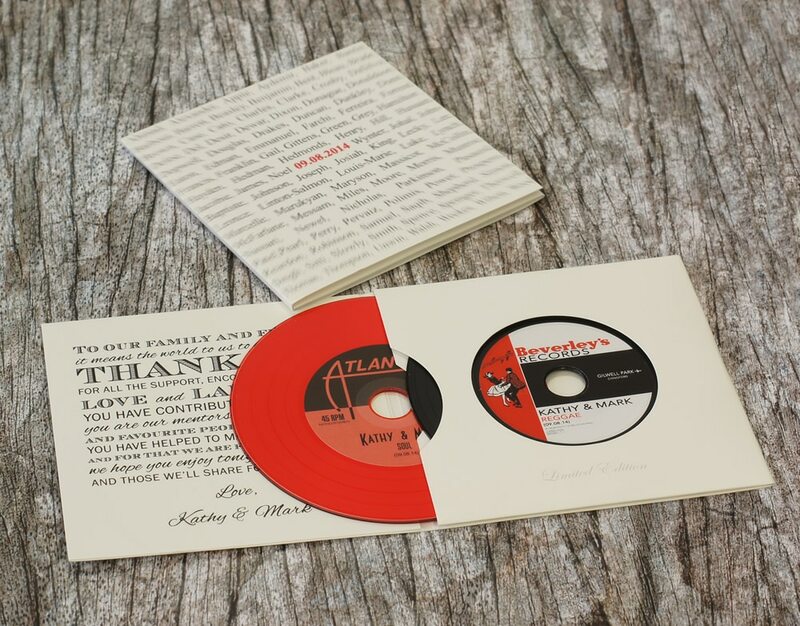 The frames can include both a copy of the disc and also the packaging and are available in black or white borders with black or white backgrounds. For quantities of fewer than 1000 discs we use a full colour high resolution laser print onto gloss or matt permanent labels that are then applied to the discs. The matt labels go very well with our recycled card packaging and have a similar slightly rough texture. 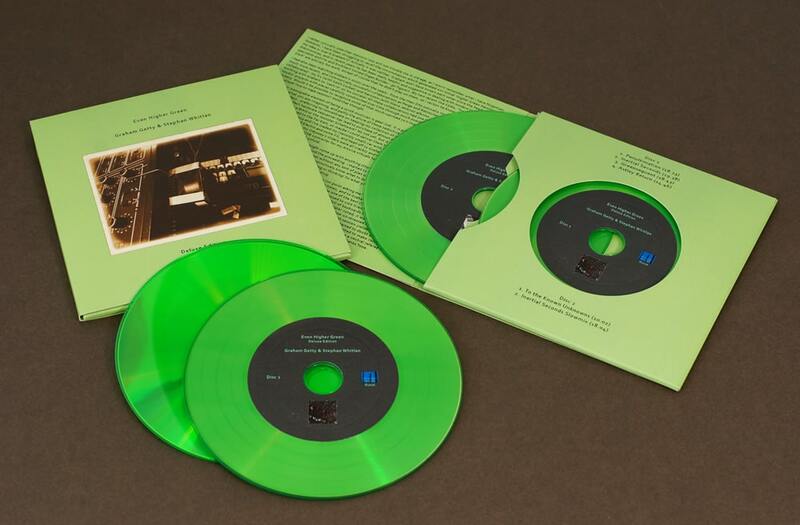 For quantities of 1000 discs or more we can use a direct-to-disc full colour offset litho or silk screen print onto the discs although you can still go for labels if you prefer. 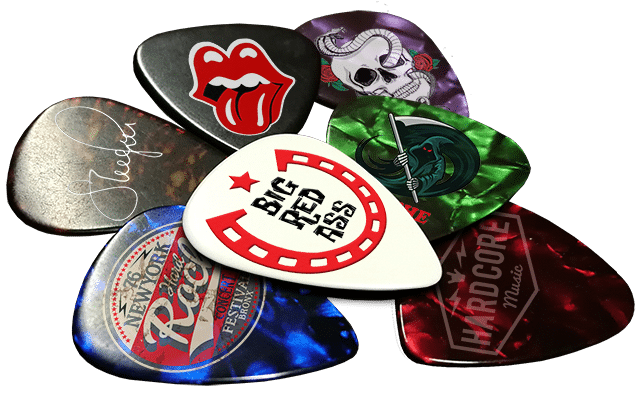 When placing an order with us, why not add some custom printed guitar picks with your band logo on? The picks are available in different thicknesses for acoustic/electric and bass guitars and also lots of different base colours. We can then print full colour on-body artwork with partial white base layers and spot gloss layers if required. Ideal for not only playing with, but also for merch stands, added value online CD/cassette/vinyl sales or freebies for fans. If you will be selling your discs or cassettes through a retail store then you will probably need to register a unique barcode for your release and apply it to the rear outer artwork of your product to make it possible for them to sell via their product barcode scanner. In Europe we use the EAN 13 barcode system and in North America the UPC system is used. We can register an EAN 13 barcode for you and embed the barcode graphic within your disc or cassette packaging artwork for just £12+VAT. The only information that we will require from you will be the name of the band/artist and the title of the release, then just leave a suitable space in your artwork and we will register the barcode and add it to your artwork for you, all for just £12+VAT. For further information about barcodes, please read our barcode FAQs. The above prices include courier delivery fees to a single UK address. International delivery can be arranged, please click here to view our overseas delivery rates. 1. By email If the artwork (and contents if we are burning the discs for you) are less than 10MB then you can email them to us here. 2. By uploading online Any size of files can be uploaded to us free of charge online via our WeTransfer upload - please remember to provide your order details (band name, type of cassettes required, packaging type, total order quantity and delivery address) in the information field when uploading. There are often many questions that customers may have that are not answered above, in which case please do not hesitate to pick up the phone or email us and we will try to help. Our contact details can be found here. We also have an extensive CD production FAQs section which may help to answer your questions.